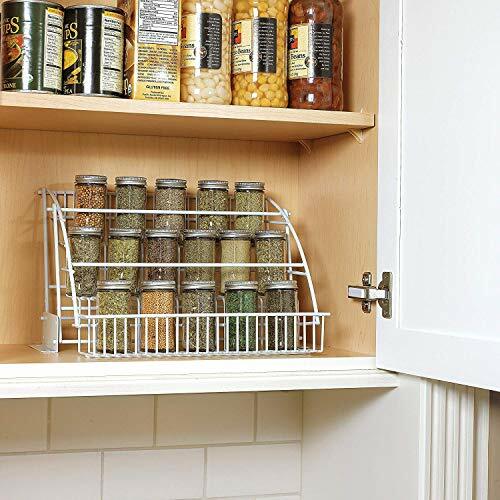 Maximize pantry storage space and keep spices organized with the Rubbermaid Pull Down Spice Rack. This spice rack organizer securely mounts on cabinet shelving and simply pulls down to display spice jars, making it easier than ever to access. Designed with wires spaced further apart, contents can quickly be identified so finding the right spice for your recipe is a breeze. Each row features a white plastic tray to prevent items from falling through. Holds up to 18 spice jars (not included). Hand wash recommended. 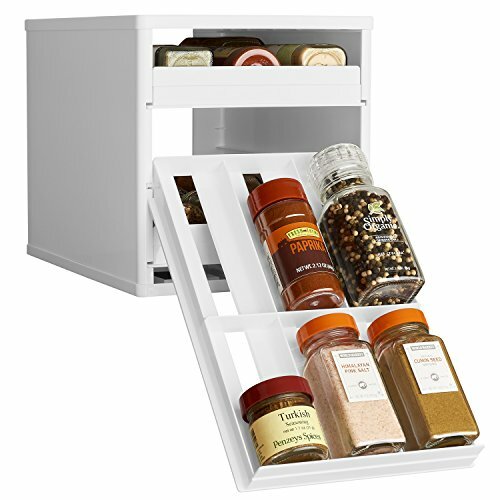 The 222 x 2 x 11 Spice Rack offers large capacity in a small space with complete access to the back row of your cabinet. This is our most popular selling product and it accommodates both standard and half-sized sized spice containers (i.e. ; Penzeys, McCormicks, Spice Islands, etc. ), no need to re-package. The drawer unit arrives pre-assembled with the necessary mounting screws. Vertical Spice products are the unique and ultimate kitchen cabinet storage solution. Flexible bands and clear panels provide easy and complete access to your stored flavors. Steel ball-bearing slides give smooth, sturdy and long life to the drawers. The drawers and base are PolyTuf HDPE for strength, long life and easy clean-up. Units can be placed in new, old and renovated cabinets and just a Phillips screwdriver is needed for very easy mounting. We have a complete line of many unit sizes and configurations for you to mix and match to meet your custom organizational needs. 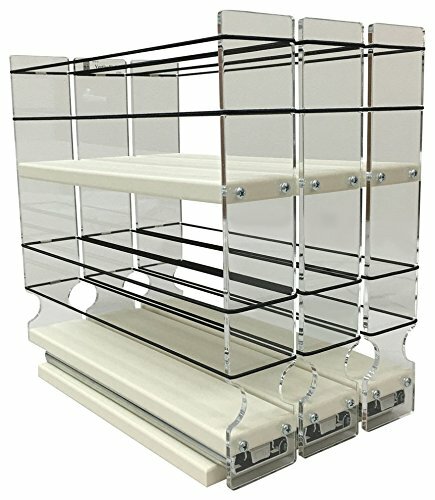 With the Copco Non-Skid 3-Tier Cabinet Organizer you can keep your cabinets organized and your items conveniently in view. A three tier design allows you layer your favorite spices, or cans and sauces, while keeping their labels in view. 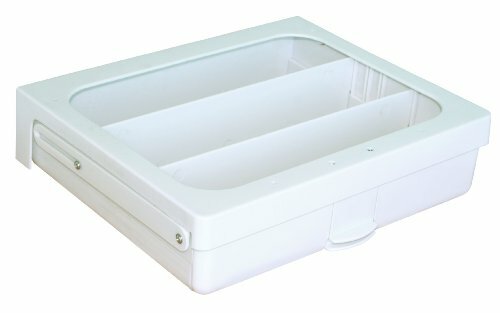 You can also use this organizer to display figurines, office supplies and more. Use it to organize perfume, nail polish or other beauty products. It can comfortably fit about 18-24 spice jars, depending on size. It can also hold about 15 standard cans (5 on each tier). Each shelf is 2 3/4-inch deep. This organizer can be used on your countertop or hidden in a cabinet. Buy multiples to organize any room your house or apartment. 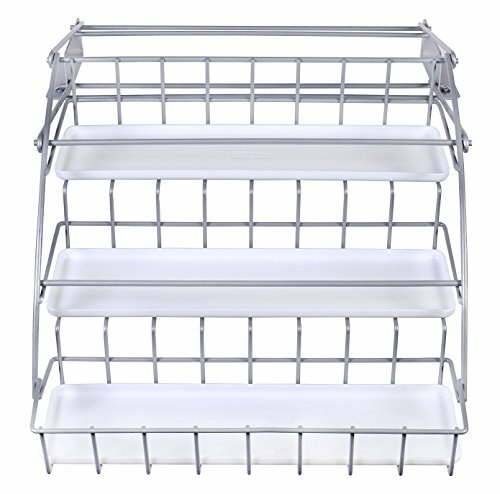 You'll find endless uses for this 3-tier organizer! The Original SpiceStack holds 18 full-size or 36 half-size spice bottles neatly out of sight in the kitchen cabinet. Turn a jumbled pile of spices into an organized system that fits in just over 8" of cabinet space. This spice rack has three drawers that pull straight out and lower to resting position so you can find and reach your spices in a snap. Patented drawer design accommodates both round and square bottles. Includes 48 pre-printed and 48 blank drawer labels for custom organization. 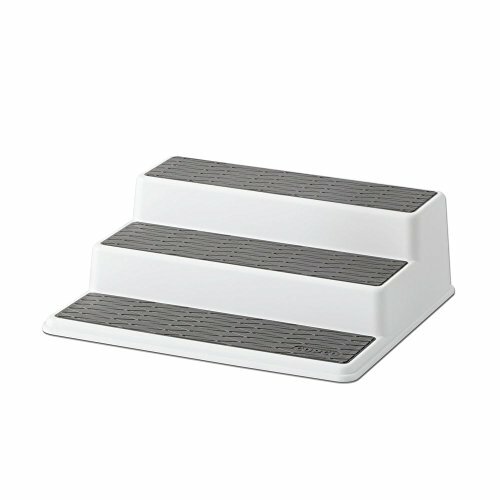 Nonslip feet and stackable. Stop looking and get cooking with the SpiceStack! 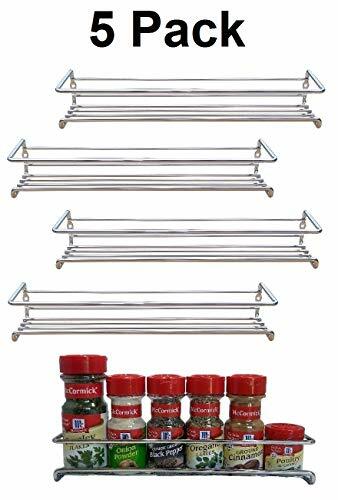 5 Heavy gauge chrome finished spice racks for spices and seasonings set This wall rack is easy to install on wall, pantry, cabinet, or closet doors. Great to be used as bathroom wall organizer or perfume organizer or spice organizer Space the racks to fit your short and tall spice bottles. Our Rubbermaid Spice Rack has a unique pull-down design that will makes cooking more fun and easier than before! This allows you to find spices and herbs faster without the hassle of peeking through or taking all bottles out of your cabinet to find the one you're looking for - save yourself time and energy with our pull-down, 3-tier spice rack. The white metal spice rack mounts onto the cabinet shelf and all necessary hardware is included for easy installation so you can begin to use your pull-down spice rack the very same day! Note: Spices and jars are not included. The mDesign 3 Tier Pulldown Spice Storage Rack makes the most of the storage space in your kitchen cabinets. The three-level shelf design makes it easy to see what's stored on each level and quickly grab what you need. Each shelf keeps spices, baking supplies and more in one compact and convenient place. This smart storage solution makes everyday living a little easier. 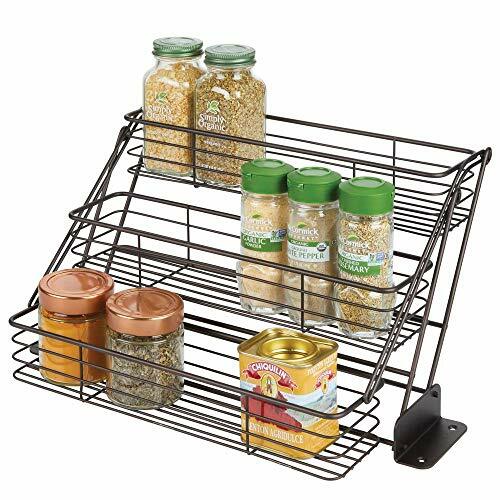 Size: 15.25"H x 12.5"W x 2.75"Dx 12.5\"
Want more Rubbermaid Spice Rack similar ideas? Try to explore these searches: Provence Orange Soap, Claddagh Holder, and Paw Bath.